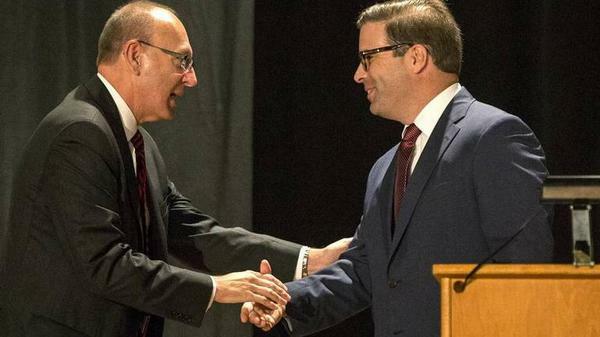 The Lindenwood University board of trustees voted Friday to fire university system president Michael Shonrock (left).In this 2015 photo, Shonrock is shaking hands with Brett Barger, who was the president of Lindenwood University-Belleville until Jan. 22. On Jan. 22, Shonrock announced to students and the faculty that Brett Barger, who had been serving as president of Lindenwood University-Belleville since shortly after Shonrock was named president, had left the university. Barger had been placed on administrative leave last fall. Dobson, who said he was speaking on behalf of Shonrock, said he expected to receive a letter from Lindenwood but had not received it as of late Friday afternoon. “I think it’s a sad day for Lindenwood University,” Dobson said. Shonrock was a “very charismatic” leader for Lindenwood, Dobson said. Dobson said a decision had not been made yet regarding Shonrock’s next step. On Tuesday, Shonrock had told reporters that he had been placed on paid administrative leave. Art Johnson, who had been the vice chairman of the Lindenwood board of trustees, on Wednesday was named the university system’s interim president over the campuses in St. Charles and Belleville. The board of trustees has formed a search committee to find a new president, according to a statement released Friday night by Dr. J. Michael Conoyer, who is chairman of the board. Conoyer’s statement did not give a reason for Shonrock’s dismissal. It said Shonrock “is leaving his position as president of Lindenwood University” effective Friday. Shonrock earned $391,202 in salary and benefits in 2016, according to Lindenwood’s most recent IRS form on file with GuideStar, which monitors nonprofit organizations such as Lindenwood. Lindenwood’s St. Charles campus dates to 1827 while the Belleville campus was founded in 2003 in the former Belleville West High School at 2600 W. Main St.
Mike Koziatek is a reporter with the Belleville News-Democrat, where this article was originally published.